Milan “Milenyo” Melindo of Cagayan de Oro City won by a close but unanimous ten round decision over Anthony “Baby Assassin” Villareal of the U.S. in front of a sell out crowd at the Waterfront Hotel and Casino in Cebu City Thursday night. Melindo (20W-0L, 5 KO’s) jumped on Villareal at the opening bell and scored a knockdown with his right hook. Villareal got up and tried to keep a safe distance by moving and jabbing. The American found his range in the third and landed one-two combos but Melindo closed the distance and landed hard shots at the end of the round. 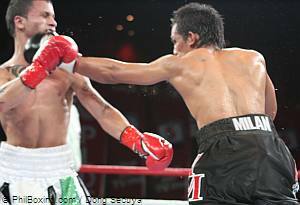 In the 4th the shorter Melindo scored repeatedly with his jab and a right hook staggered Villareal again. 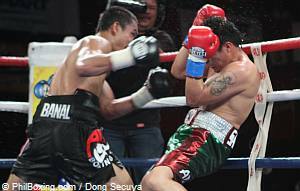 Melindo continued to invest in body shots but Villareal was still standing and countered effectively. In the fifth, Villareal tried to give Melindo different looks by switching to southpaw. Villareal continued to box from a distance but Melindo managed to cut off the ring. But the ALA gym fighter missed a lot of shots as Villareal was very slippery. In a breathtaking seventh round, the fighters traded wicked hooks as Melindo landed rib rattling punches. Melindo landed the harder blows in the 8th and 9th but in a nail biting tenth round, Villareal hurt Melindo and pressed the initiative until the final bell. Top photo: Melindo (R) connects to the jaw of Villareal in this bit of action from their WBC Youth Intercontinetal fight Thursday night at the Waterfront Hotel in Cebu City. (L-R): Trainer Rey Caitom, Smart and ABAP's Patrick Gregorio, MisOr Governor Oscar Moreno, Melindo and GAB Chairman Eric Buhain. The scorecards read: 97-93, 95-94, 96-93. Melindo took Villareal’s WBC Youth Intercontinental title and preserved his lofty world ranking and undefeated record. Villareal drops to 9 W – 3 L with 4 KO’s. In the co-main event, AJ “Bazooka” Banal of Ermita, Cebu City knocked out Cecilio “Boga” Santos of Mexico in the fourth round. AJ Banal (L) puts on the pressure on Santos in this bit of action from their Thursday night fight at the Waterfront Hotel in Cebu City. The southpaw Banal was tentative in the opening round but started to find his range in the second and third rounds landing hard shots. He landed a powerful left to the temple in the 4th round that staggered Santos and Banal flowed up with a furious volley. The Mexican was counted out in 35 second mark of the 4th round. James Bacon pinned Thittichon Singwancha on the ropes in the 4th and landed a hail of punishing rib shots and the Thai dropped to the canvas. Official time of TKO win: 55 seconds of round 4. Bacon is now 14W-1L, 9 KO’s. James Bacon (L) looks for an opening against Thittichon Singwancha. 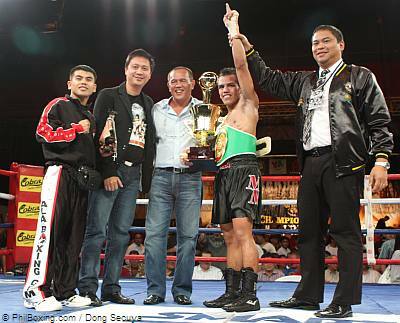 Larry “Bon Jovi” Canillas used a two fisted attack against Petch Twins Gym of Thailand and scored a knockout in the second round to continue his knockout streak to four fights ending in three rounds or less. Canillas is now 12W- 1 L, 11 KO’s. Larry Canillas (R) connects with a left cross to the jaw of Petch Twins Gym. Jayson Inso scored a knockdown in the first round and won by four round unanimous decision over Jonel Gadapan. The scores- 38-37 for all three judges. The clown prince of Cebu boxing Jojo “The Flash” Intor won by four round majority decision over Romnick Hoybia in a blood soaked affair. Intor lived up to his billing and had the crowd in stitches with his ring antics. But he was bleeding on the right forehead from an accidental headbutt in the second round. In the third another headbutt opened a cut on his left temple. The two headbutts resulted in a total of two points deducted from Hoybia’s scorecard. A smaller scalp wound also opened up and Intor’s face was a gory mask at the end of the fight. The scorecards read – 39-35 and 38-36 for Intor and 37-37. Four amateur boxing national training pool members were featured in the event. Irish Magno beat Katrina Jane Recaido on points in the women’s side while for the men, Adonis Cabalquinto beat Jimmy Vallares also on points. Exhibition bout showcasing elementary school boxers from Mandaue City opened up the festivities. These boys will represent Mandaue in the national amateur championship in Palawan later this month. An entertaining Sinulog Dance number by students from APAS National High School was presented before the main event. Cebu’s first big boxing event for 2010 was billed as “BAKABAKAN SA SINULOG” and sponsored by SMART Communications and TV coverage courtesy of ABC 5. Click here to view a list of other articles written by Rene Bonsubre, Jr..